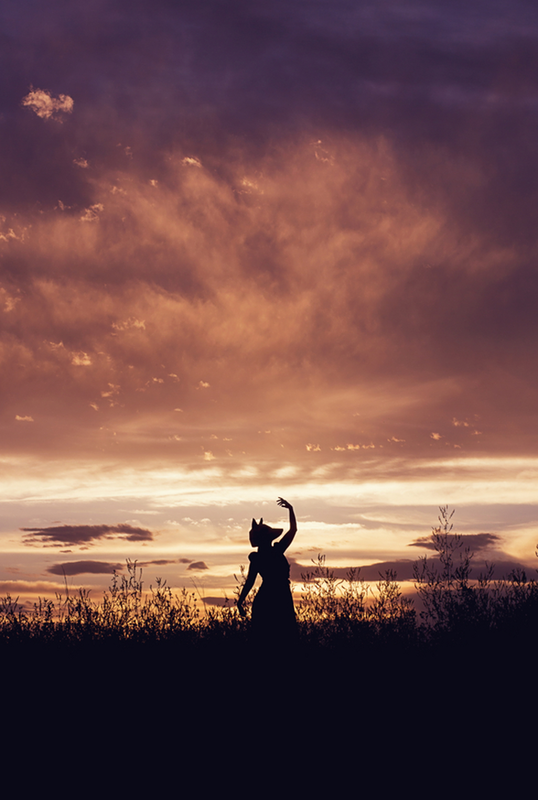 When freelance Denver photographer Kyla Fear (whose business is called Fearless Photography, which is awesome in itself) submitted this gorgeous shoot to us, I instantly approved it. 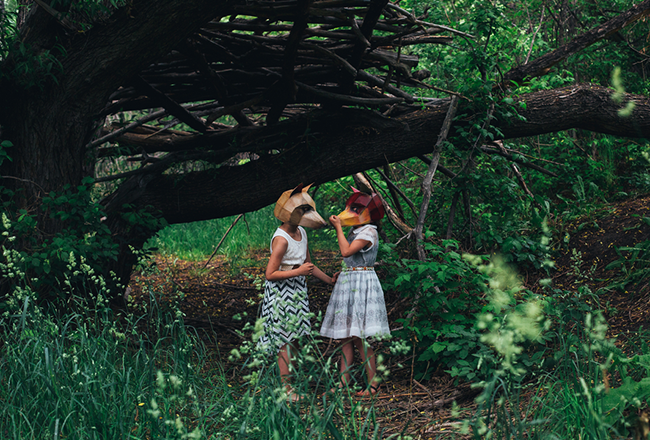 I love everything about it - from the beautiful location to the clothing to the creativity (those masks!) to the overall vibe (which is equal parts adorable and edgy). And the photography itself is just stunning. I asked Kyla to share a little bit about the shoot and what inspired her. "On a chilly spring day, my good friends and I ventured out to do their annual family shoot. This is a family full of artistic and creatively inclined beings, and this year we wanted to bring something a little extra to their shoot," Kyla explained. 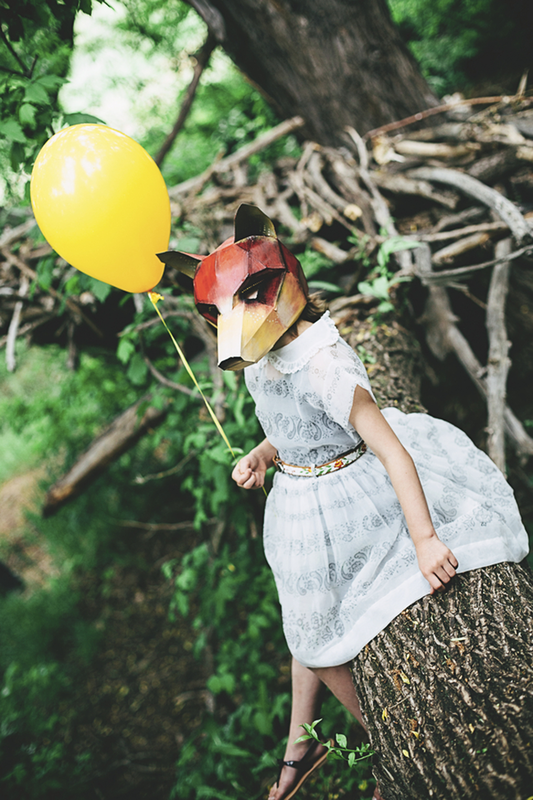 "I wanted to use fox masks and create a dark but whimsical shoot in this location that was just dreamy. The day of the shoot we got a big rain storm and there was very little light and it added to the overall feeling in the images." 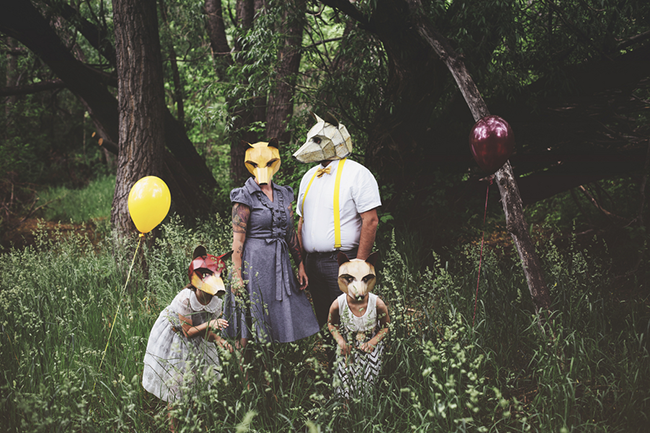 "We found these spectacular fox mask templates by Wintercroft Masks," Kyla said. 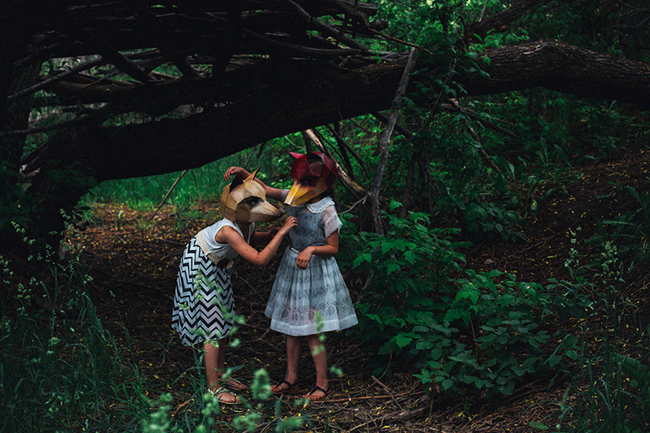 "My friends built the masks, and then hand painted each mask, bringing individual personality traits into them. 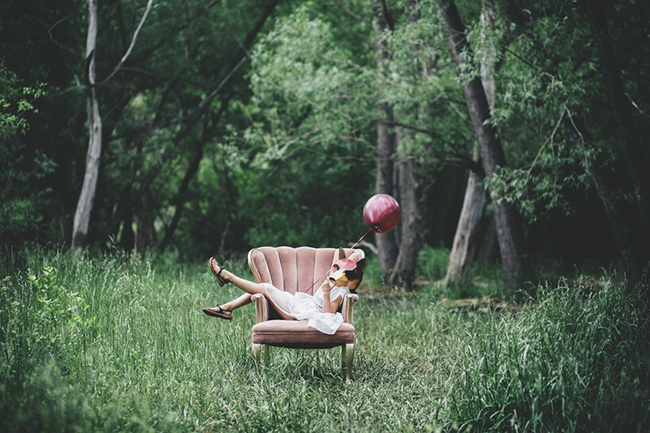 We added a vintage flare with their wardrobe and a beautiful antique chair from Vintage Rentals Denver. 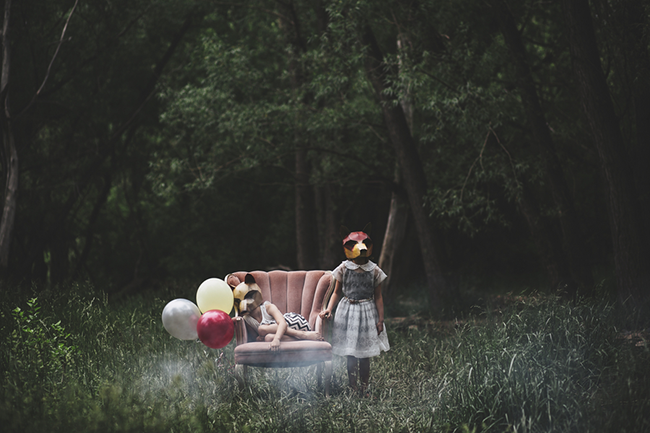 I added a bit of dark by adding fog and a bit of whimsy through the balloons. The shoot was so much fun, and I'm so excited to be working on a whole series that includes these amazing Wintercroft Mask designs, built and painted by my friends Ben and Shannon Faber." 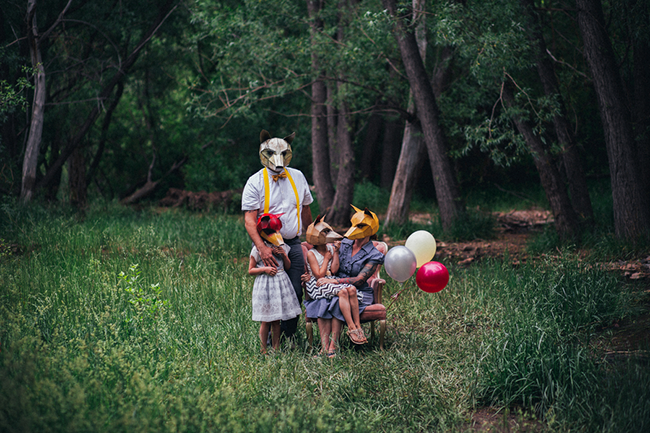 Kyla says that although she's mainly specialized in family and child portraiture in the past, over the last year she has been exploring more of a fine art element within her work. We'd say she's doing an incredible job so far! 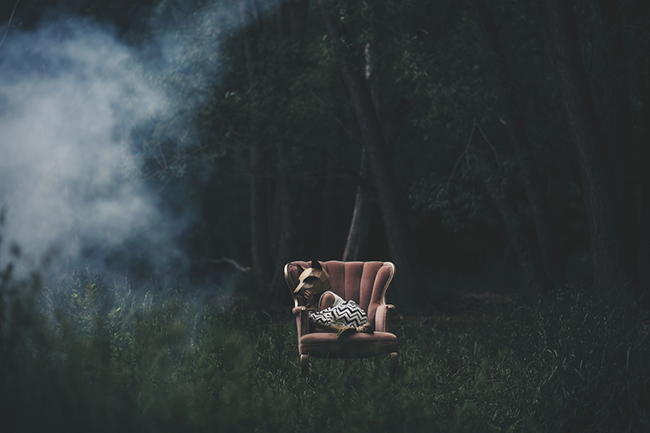 You can see more of Kyla's work on her website, Facebook, and Instagram. You are so right about tile of this post! it is FUN - tastic and artistic photos! Oh man, I actually find this a little scary! But then, I've always been freaked out by masks so this is nothing new, haha. I do like the woodland setting, though. That would be a lot of fun. This is amazing! So unique and really gorgeous! 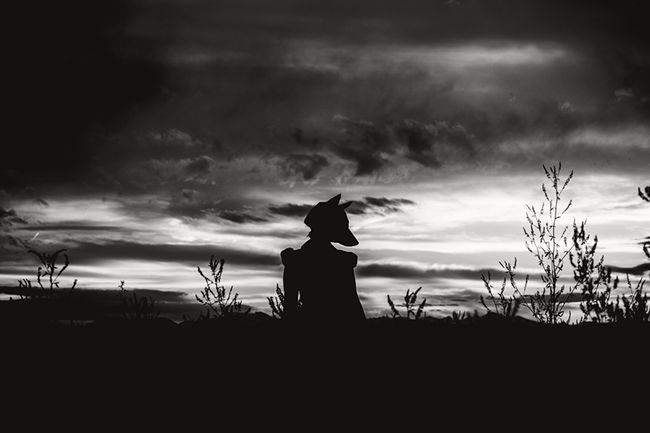 I love that fox sihouette against the sunset backdrop! Cool! 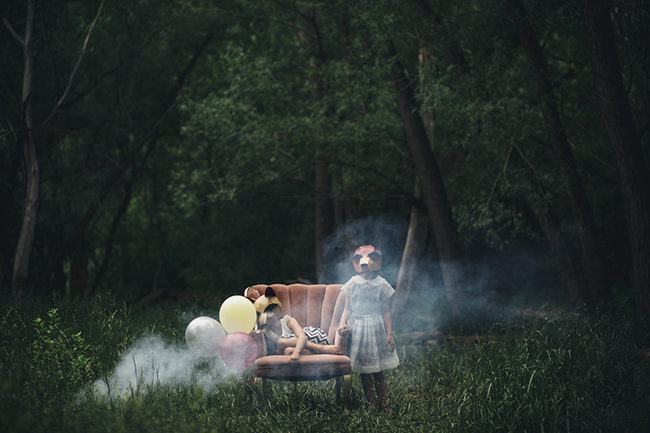 And the photo of the little fox girl in the chair with the balloon - so whimsical! If I'm not mistaken I've seen one of these photos in Etsy finds recently! I love the last two silhouettes! What a fun photo shoot! Wow! This looks like it was a lot of fun. Those last two shots are my favorite. Thank you thank you thank you! So amazingly cool to see this on your site today! Obsesseddd. Coolest photos I've ever seen!! Oh my gosh, this is just wild! 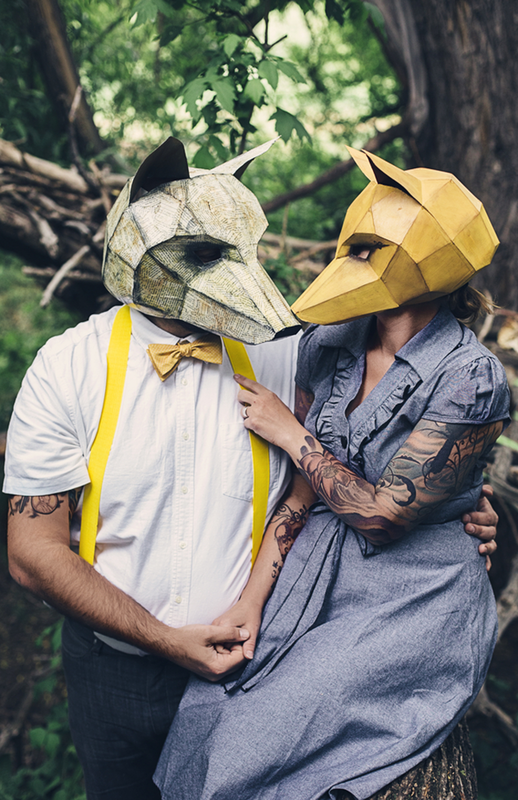 I love the masks - they've got me thinking of my own photoshoots and creative things I could do. Thanks for your comments everyone! It's such a gorgeous shoot. Thanks again to Kyla for sharing it!